Many people come to Yosemite and miss what is probably the best view -- Glacier Point and vacinity. The road closes to cars (open to cross-country skiing) with the first real snow. The goal is to open the road to cars for Memorial Day weekend, (for 2015 it opened in late March, before the usual post winter survey for plowing). 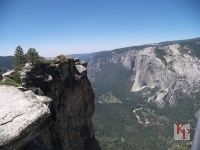 The valley is visible along with Yosemite Falls, Half Dome, Vernal and Falls plus the views up Tenaya Canyon above Mirror Lake. Trails from the Glacier Point road lead to less crowded views such as Taft (easiest of these), Dewey, Crocker and Old Inspiration Points. You can avoid the drive up and take the Four Mile trail (4.8 miles each way, don't ask, 3200' elevation gain), or the Glacier Point Shuttle (not frequent like the valley floor shuttles). The Panorama Trail (8.5 miles, one way, 3200' down) is a good alternative route down -- it can be almost as fast going down via the Mist Trail to the bridge as driving to the valley and walking up to the bridge above Happy Isles. If you drive this far, go to the point itself. Some people are so impressed by the initial view of Half Dome and Vernal and Nevada Falls that they leave thinking there can't be any more. They miss Yosemite Falls and the views down to the valley. 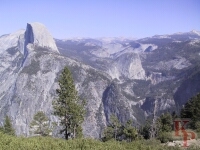 The first thing you see as you walk to the view point is Half Dome across the Merced. Look closely and you may see the hikers on top. Clouds Rest is behind Half Dome and a little higher. This is the kind of view you come to Yosemite to see. Visitors who spend all their time in the valley will miss this. Parking at mid-day is often a problem (see the hiking options), indeed on high traffic days they divert traffic to the Badger Pass ski area to wait until some cars leave (expect it after 11:00AM on busy weekends). Look at the Yosemite NPS Traffic Forecast Page. Vernal (think verdant, green -- the Mist Trail), and Nevada (think high, the upper one) Falls are also visible and run full in June. But by September it can be difficult to see them from Glacier Point and if you hike up you wonder where the mist went on the Mist Trail. Washburn Point: the parking area just before the final drop to Glacier Point, provides one of the best views of Half Dome and the Merced Canyon towards Little Yosemite Valley. 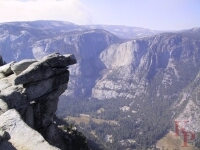 From Glacier Point you see the face of Half Dome, but from Washburn Point you do not. This is a stop that can prompt an "Oh wow" from a teen-ager. Often parking is easier here than Glacier Point since people usually do not stay as long. Sentinel Dome: an easy trail if you park early enough to get a space (if you are late, the parking is harder than the trail), provides outstanding views without the crowds. The parking lots on Glacier Point road seem to be sized to fill up before the trails get really crowded. But with any hike, arrive early and have the scenery almost to yourself. Note that the angle of Half Dome is about the same as at Glacier Point (but higher) and clearly to the left of Washburn Point. The Taft Point trail leaves from the same parking lot as the Sentinel Dome Trail (or you can do both as a loop). The trail starts through trees then drops quickly to the fissures area -- this is a trail, not a high tourist area, so railings are few. At Taft Point you get views of the valley and Yosemite Falls. Long ago cars were driven to the edge for pictures, but times have changed for the better. In the winter the road closes at Badger Pass and you get a better view of the scenery from skis. The overhanging rock at Glacier Point. In the old days people danced on it. Through much of the summer you can see Yosemite Falls across the valley. Return to my Yosemite page.